gunsnfnroses: Dj Ashba: "It'll be a Cold Day in Hell Before Axl & Slash Play Together Again"
Dj Ashba: "It'll be a Cold Day in Hell Before Axl & Slash Play Together Again"
According to Dj Ashba, it will be a "cold day in hell" before former GN'R bandmates Axl Rose and Slash collaborate again, quashing rumors of a possible reunion. When Becko of Australia's long-running rock radio station Triple M questioned Dj ahead of GN'R's show at the Sydney 500 V8 Supercars about the reports of Axl and Slash possibly getting back together, he shot it down. "That's completely false," Dj said. "I know Axl really, really well, and he basically said that it would be a cold day in hell. But, that being said, obviously I don't know the inside insight and I'm just happy to be in the shoes of an amazing, legendary guitar player. 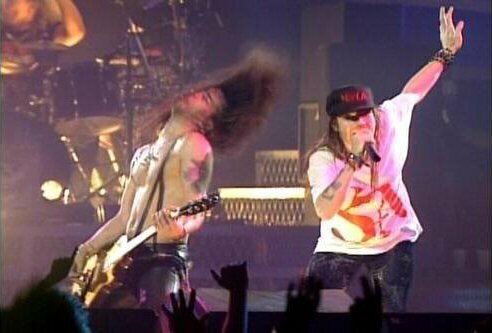 It's really a treat for me to stand on stage next to somebody like Axl and this band. Everybody in this band is just top-notch musicians." As for "Axl Time," Rose's infamously late appearances onstage, which, according to Slash's autobiography, Slash, were one of the main reasons key Appetite for Destruction songwriter and former GN'R rhythm guitarist Izzy Stradlin left the band, Ashba claims that they have nothing to do with the enigmatic singer — they are the fault of the room-service staff at the band's hotels. "It isn't even Axl that's late, it's always our room service that's late. We're waiting to eat before we go on," Ashba joked. Listen to a clip of Ashba's interview with Triple M below. As previously reported, GN'R kicked off an Australian tour in the city of Townsville last Wednesday night (December 1) and immediately made both local residents and fans angry. According to local media reports, Townsville residents slammed the group for starting over an hour late and ending some 75 minutes after a curfew on a weeknight. Authorities were reportedly investigating whether the event's promoters should be punished with a fine for breaking the terms of their entertainment license. The show ended past midnight with a fireworks display that left many pet owners in the area complaining that their pets were agitated. As usual, blame for the delay seemed to rest at the feet of Axl Rose, who kept the audience and the rest of his band waiting. One fan said, "Everybody knew Axl would come on late — it's at the stage now where you think you're lucky because it was only an hour or so. It was a great show. I don't have any complaints about that. But he needs to remember people have ordinary lives to go home to and have to get up in morning." Another concertgoer added, "The atmosphere was fantastic but coming on so late meant the whole night was only average," while New Zealand's 3 News interviewed one fan who was upset at the lack of original members in the lineup, saying, "I think it's an imitation band — it is absolutely terrible." Other fans complained that the expensive VIP packages they bought did not deliver all the perks that had been promised. The venue, called Reid Park, has only recently been converted to a concert facility, angering local residents who were not made aware of the change. The band and Rose drew fire earlier this year from UK promoters, who cut the band's set short when they came on late and broke curfew at two British festivals. I just felt a chill!